In the latest version of Omniscope 2.8 (b1057) we have removed the GEOCODELAT and GEOCODELONG functions. If you try to use either of these functions Omniscope will now show an error and you will not return any data. If you have any Omniscope files that use either of these functions you should remove them. These functions were removed because both of the providers used (Yahoo and Cloudmade) are no longer available for free; they both charge a fee for using them and require an additional billing and authentication sequence. This would not be possible to include inside a formula function. As an alternative we have now added the "Geocode" operation. To use this operation in DataManager, connect the operation to a block with a field containing location data that you would like to geocode. After connecting you can select which geocode service you would like to use. 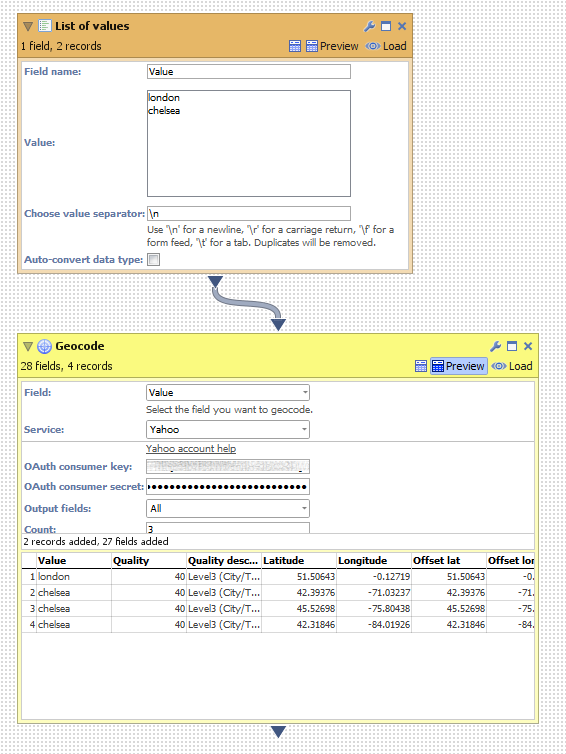 After selecting the service you can then configure the service and execute the operation to obtain your geocoded data. In Omniscope 2.8 we have added a single Geocoding service: Yahoo. In Omniscope 2.9 we will be adding an ESRI geocoding service. Please let us know if there are any alternative services you would like us to add. Because Yahoo is now a paid-for geocoding service you need to sign up to Yahoo to use it. To sign up you need to create a Yahoo account and then create a Yahoo BOSS auth key and enter your payment details. Once you have signed up you can enter your OAuth consumer key/OAuth consumer secret into the Geocode operation to geocode your data. It might be advisable to set an upper limit on the amount of money charged for using the geocoding service per month, just incase you inadvertently try and geocode a large number of records. This can be configured in the setup process. It's easier to manage and maintain. To edit a function you need to use a field organiser, locate the formula field and then edit the formula. Typically you will be using both GEOCODELAT and GEOCODELONG so if there are any changes you need to edit both of these. The Geocode operation is much easier to locate and change as necessary. You can obtain more data. The GEOCODELAT and GEOCODELONG functions only return the corresponding lat/long values. With the Geocode operation you can obtain additional data. In the Yahoo geocode service there are around 25 additional fields such as "quality," "city" and "country". You can select which fields you want to include when you retrieve your data. You can obtain multiple matches. The GEOCODELAT and GEOCODELONG functions only returned the lat/long values for the best match. In the Yahoo service you can enter a "Count" parameter. This can be used to specify the maximum number of results to return per location. In the example above we have used a count of "3" and obtain 3 results for "Chelsea". Please let us know if you have any comments or questions about these changes. I expect its necessary because the providers you were referencing don't like it. However I think that some customers will be dissapointed. It was necessary to remove the geocode functions because the providers started charging to use them. You can still perform geocoding in Omniscope, but now you need to use the geocode operation instead. Can you expand on why you think that some customers will be disappointed? I think the logistics services companies we deal with would be leveraging the geocoding for free, which was a great feature - although of course dependent on the goodwill of the providers being used. They loved it when I first showed it to them. One other provider which would be of interest to LLamasoft is Bing. We encourage our clients to obtain accounts and so it could be that they can use the same account reference in Omniscope as well as our tool. Besides that we are referencing Google but I normally recommend to people that they only use that to geocode a few "difficult" addresses after trying other matches.